There were few dogs as consistently happy and joyful as Moia, a sled dog who took her ultimate leave Christmas Eve morning. It was a time when high-quality dog food was purchased and delivered every fall by the pallet. A literal ton of kibble in 62 bags that required sorting and stacking in the garage. A time when 40 bales of fresh straw also showed up in the fall to be piled in the tractor shed and covered with a blue tarp to protect it so it could serve as dry bedding all winter for the dogs. Last week, I went out carrying a small bucket with a single serving of kibble, canned food and water mixed up for the lone husky left in the yard. It’s been a tough year here on Rusty Metal Farm when it comes to dog mortality — not a real surprise when your dogs are all around the same age when you get them. In my case, the bulk of my kennel dogs were around 6 years old when they came to live here in the years between 2008 and 2010. Perfect ages for recreational mushing or running the one 30-mile race we completed in 2010. The years passed and the dogs and I got older. For their part, the dogs were willing, but the years were taking their own toll on them as joints stiffened, eyes dimmed and muscles weakened. One by one I made the tough decision to retire them to a life of leisure and snacks in the dog yard. And, as time wore one, one by one, they started to die off, as I made the loving but painful decision to have them put down when they got too infirm. This last year was by far the worst with a total of six dogs crossing that fabled Rainbow Bridge. And each one took a little piece of my heart with them. The most recent was little Moia, the smallest sled dog I have ever ran. Weighing in between 35 and 40 pounds, she was sweet, shy and smart enough to know just how fast to run in team so her line was tight, but not actually pulling. Annoying? Yes. Especially when she did that for the first 25 miles of that 30-mile race. I guess she decided to actually put some effort in over those last five miles because she was bored. But here’s the thing — she was also the dog for whom every single run was new and exciting. It didn’t matter if we ran the same trail every day over and over again for a month. She always found something new to be excited about and wore a permanent grin the entire time. How could you not love that and not forgive the lack of pulling? A fun, feisty member of the team, it was Moia who got the brunt of the spray the day a skunk made an ill-advised run smack through the middle of the team as we were on a run. It was Moia who, while on a free run with me one day as I snowshoed, helpfully retrieved — and delivered to me without my asking her — the bottle of beer I had tucked into a snowbank to enjoy on my return home. Always happy to join in a group howl, it was Moia’s voice that rose above the others in an unfortunate and very un-huskylike cross between an off-key yodel and Velociraptor scream. Since this past summer, it was the cloudy eyes of an aging Moia who greeted me every time I stepped into the dog yard where she lived with a much younger dog named Pi. Moia, the last of that cherished race team. The last furred or feather critter on Rusty Metal Farm who had known my late husband Patrick. On Christmas Eve morning she greeted me as always, front legs on my chest, head up to be hugged, then back on all fours to accept her morning treat — this day a special holiday beef meatball. While Pi took her meatball and galloped off to gulp it down, Moia, ever the lady, daintily took hers and then dropped it. As she put her head down to retrieve it, she appeared to slip on some ice and fell to her side, all four legs kicking as she tried to get up. I rushed to help her, and as I reached her, that kicking stopped. Her eyes became fixed and her breathing erratic and shallow. Five minutes later, she was gone and on her way over the Rainbow Bridge to join her teammates and Patrick, the only sled dog I’ve ever had to die in front of me like that. Thankfully, a friend is staying with me and was here to support me as I processed Moia’s passing, likely from a brain aneurysm. Now, it’s just the youngster Pi out there in the yard and let me tell you, there is nothing as lonely as a sled dog bereft of her teammates, and we are doing our best to console each other. 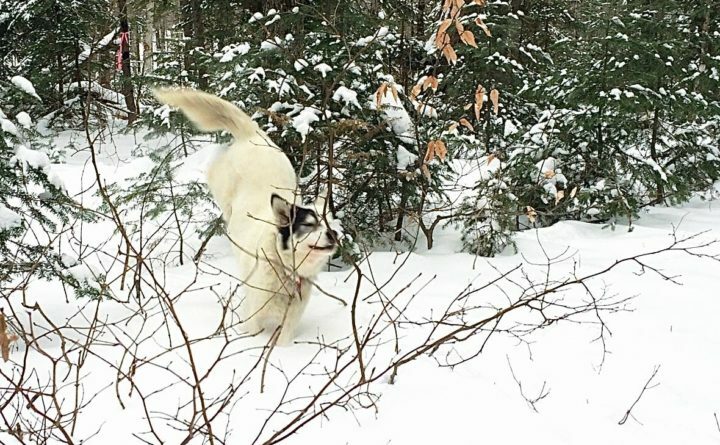 But as the era of mushing and sled dogs on Rusty Metal Farm comes to its official end, I take comfort in this: Moia took her leave on a sunny, gorgeous northern Maine day, in no pain in the company of the musher who loved her best and after getting her favorite snack. May we all be that fortunate.